Hoping to set a 5th Guinness World record, the world’s top water safety and training organisations, including our founding partners the STA and RLSS, are joining forces to present The World’s Largest Swimming Lesson™ (WLSL), Friday, 20th June, 2014. The event is all in aid of building awareness around the vital importance of teaching children to swim to help prevent drowning. On 20th June, waterparks, pools and other aquatic facilities around the globe will host local WLSL lessons simultaneously at 11am Eastern Standard Time (3pm GMT) in an attempt to break the Guinness World Record. As we all understand swimming is a life-saving skill for children. It is a vital tool to prevent drowning, the second leading cause of unintended, injury-related death for children ages 1-14, which is why we strongly feel it’s important for swimming teachers to hold industry approved qualifications and to be committed to ongoing professional development. The World’s Largest Swimming Lesson™ has been created to serve as a platform to help local aquatic facilities and the many different water-safety and drowning prevention organisations work together to tell this important story on a local and national level. Our partners STA and RLSS are supporting this year’s event and we highly encourage our members to join in the effort by registering as an official WLSL Host Location. For more information, including a marketing pack and details on how to register your venue is available at www.wlsl.org. The event also coincides with the start of the RLSS’s annual Drowning Prevention Week, taking place on 21st June. The events going on throughout the week aim to raise awareness about the importance of swimming as a life-long skill, promoting water safety messages and help reduce incidents of drowning. RAPs member Andrea Andrews gives us a follow up on her previous blog ‘Teaching Swimming in the 21st Century’. As I have explained in my previous blog I can feel rather slow on the uptake when asked to use any new technology but I have noticed something interesting while using my waterproofed electronic iPod register device as a swimming teacher. My preschool students have become accustomed to ‘signing’ themselves present on the iPod register and the way they do this has been enlightening. Some children are keen to show that they can nearly read or start to recognise the pattern of their own name on the class list that is displayed on the device. They enjoy identifying their name but then they may struggle to record the fact that they are present on the touch screen. This is intriguing and it tells me a number of things. Perhaps, they do not have electronic touch screen devices at home or their internal state of control renders them incapable of touching the exact point required with the correct amount of force and periodicity. Or perhaps they just need time to play with it? Let me explain further, the device supplies the child’s name and a little white cross inside a red box to be touched if that learner is present, upon which it changes to a green box with a white tick inside it. If you press too hard, too long, too lightly or for too short a time the device does not register your touch and the red box/white cross stubbornly remains. Once mastered, there is no problem because the device is no more difficult or easy to use than any other touch sensitive electronics and I have grown to enjoy the lack of wet paper and the time it saves. What I have discovered is that the nature of the ‘screen pressing’ by the little children tells me a great deal about their hidden nature and their concerns about being able to cope in the watery class. After all we are often sat on the side with our feet in the zero entry beach when we press the button and each child comes along with their own set of worries and excitement about what we will be doing and what is expected of them by their carers and peers. So a child that may delight in recognising their name may fail to turn the red box into a green one because they want to emphasise that they can do something others can’t and are ‘strong’ even though they are feeling far from it in the water. This can therefore become an extended press as the child reasons that what is needed is time for the device to ‘feel’ the large amount of energy being used. So when that does not work the rationale turns to pressing too lightly and for too short a time. In the water that child struggles to engage with the water especially around their nose and eyes. Another child cannot read their name and instead heads for the red box closest to their index finger. Pressing with utter nonchalance they turn it green to register someone else who is on holiday at the time. They had no axe to grind, pressing just right; present enough behind the finger; pressure-less. Another child finds it hard to hold their index finger still for long enough to press the red box. The finger wanders at the tip, shaking and juddering as if connected to the tip of the tongue that is sticking out in concentration. This is an indication that their fine motor control is still developing or their parents have stretched their age to sign them up as soon as possible for swimming lessons. In other words being able to exert the right amount of pressure, in the right place for the requisite length of time is a skill and it takes time for this to be mastered. All of the above children would master this skill if they had the time to play with the device like I did. What it also tells me is that we must not ask too much of our little children by expecting them to copy complex skills with their minds when all that is needed is for them to arrive at it through powerful emotive, exploratory play. Taking place on the 13th – 15th of June in the stunning location of Lake Windermere, The Great North Swim is one of UK’s most popular open water swimming events and is part of the Great Swim series. 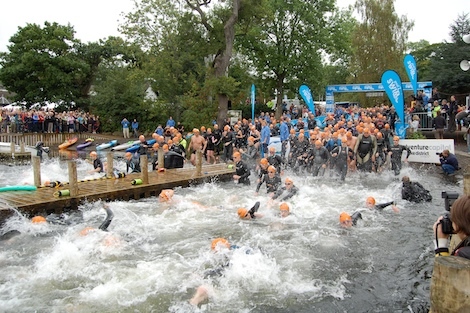 The series is the biggest exhibition of open water swimming in the UK and is the perfect opportunity to swim in some perhaps more unusual locations ranging from national parks to urban waterways (not exactly your average pool!). What’s fantastic about The Great North Swim is that it doesn’t matter too much on your ability. There are a range of distances to choose from including 1/2 mile, one mile, two miles and 5k courses, all in the safe hands of expert safety kayakers who are with you every stroke of the way. So whether you’re just starting your open water swimming journey or are at an elite level, there’s certainly something for everyone, including our ambassador, Olympic Medallist Steve Parry, who will be at this year’s Great North Swim with a few of our members also taking part. With over 20,000 people taking part in the Great Swim Series last year this is certainly one event you won’t want to miss out. Even if you don’t fancy entering yourself, it’s still a great day out for all the family to go and watch as you’ll be able to enjoy all the exciting elite races featuring world class athletes, the farmer’s market and on site entertainment. The Great swim Series will also be holding training sessions prior to the Great North Swim on the 7th June at Brockhole Visitor Centre, Lake Windermere. The training sessions welcome all abilities and will allow you to progress at your own pace in preparation for your upcoming Great North Swim. The tailored training sessions are for beginners, intermediate and advanced swimmers and training leaders will be on hand at all times. For more information about what the sessions will entail and how to get there click here. If you are taking part, or even plan to, please let us know – just drop us a quick email here. If you’d like to enter The Great North Swim or any other events in the Great Swim Series please visit the website.